Hello, and welcome to the fall 2017 edition of the Integrity Housing newsletter. We appreciate the opportunity to share the results of our season of high impact investing, creating not only homes but communities which thrive and offer opportunities. We have much to report from our distinctive “triple bottom line” communities, whereby investors provide an asset to the area with triple benefits: profitability for investors; social impact services for the residents; and a valuable, sustainably developed property for the region. Below, please enjoy a bit of this exciting news in our latest newsletter. 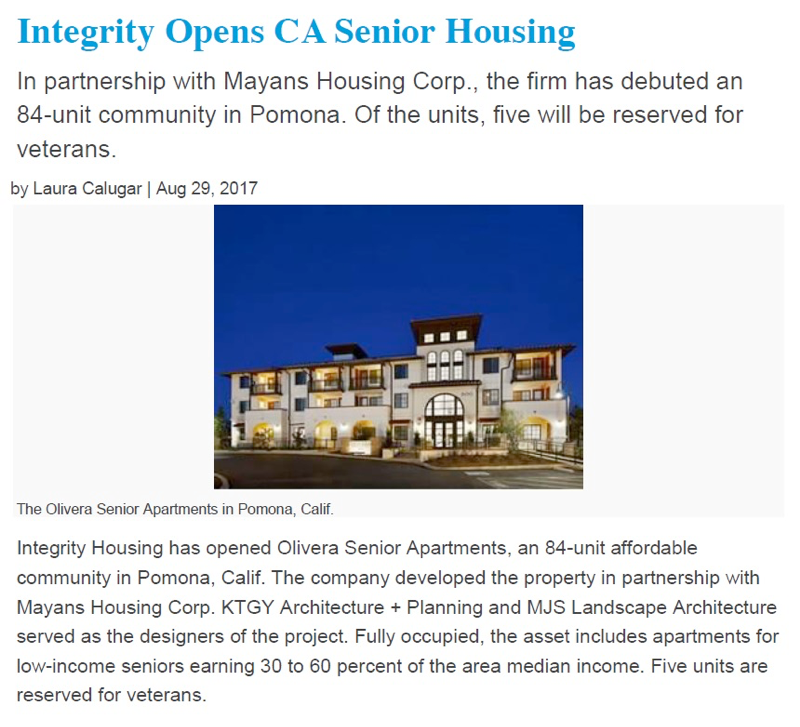 Integrity Housing’s project, Olivera Senior Apartments, was featured in several news outlets this past summer. Located in Pomona, CA, Integrity Housing recently celebrated the community’s grand opening. Olivera is now fully occupied and offering new apartment homes to 84 low-income seniors at 30 – 60 percent of the area median income, with five units reserved for veterans with Veterans Affairs Supportive Housing (VASH) Vouchers. Olivera, one of Integrity Housing’s signature developments, is the result of bringing together multiple organizations, government agencies, and financial partners to create a high quality affordable community. The property and its grand opening was featured in PRISM Magazine, The OC Register, Affordable Housing Finance, Senior Housing Business, and Multi-Housing News, to name a few. Congratulations to the entire Integrity Housing team for their hard work to provide high quality homes to 84 seniors, and to merit such outstanding media coverage! Alhambra at Mace Ranch, which sold for $28.5 million, closed in July. 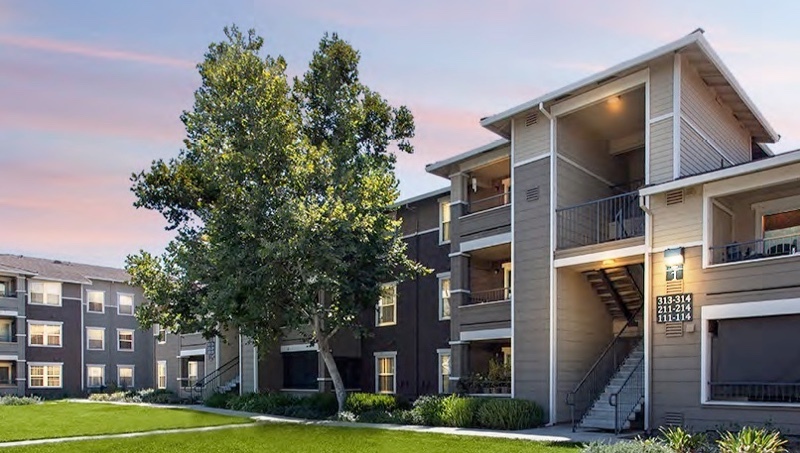 Originally built in 1999, Alhambra at Mace Ranch is a 160-unit affordable property located in the City of Davis, CA. Integrity Housing purchased the property in 2014 utilizing 501 (c)(3) Bond Financing, and spent the last three years enhancing the property’s value. Integrity Housing not only made infrastructure improvements, the company also brought in a partner, FPI Management, to re-train the management staff and provide an elevated level of service to the residents. The community offers well-appointed units with on-site parking, laundry facilities, a large club room, fitness room, management office, and computer room. There are also a number of outdoor recreation and community spaces including a swimming pool, landscaped sidewalks and paths, multi-lawn areas, and community barbeques. The property was sold this past July for $28.5 million to OpenPath Investments, a real estate investment firm focused on socially responsible investment opportunities. Integrity sold the property to raise capital to pursue their mission to build new affordable developments. 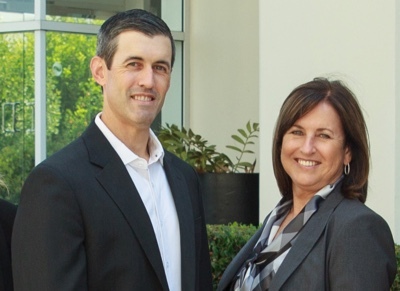 While no longer the owner, Integrity Housing continues to be involved in the property as the managing general partner. Renderings of the renovated Meadows Court and Holly Lane properties in Vacaville, CA. On August 22, 2017, Community Development Partners, one of Integrity Housing’s partners, purchased two neighboring affordable apartment properties in Vacaville, CA: Meadows Court and several units on Holly Lane (formerly part of The Willows Apartments). As the non-profit partner on the development team, Integrity Housing was critical to securing the financing needed to acquire the properties. The development team will now rehabilitate the communities, which were formerly owned by Vacaville Community Housing (VCH). Meadows Court was built in 1968 and is made up of 51 two-bedroom townhome-style units. The Holly Lane units were built in 1967 and include 16 similar two-bedroom townhome-style units and 15 one-bedroom flats. All 80 tenant-occupied units are rent restricted with AMI levels from 50 – 60 percent, with two units set aside for on-site managers. The goal of the renovations is to improve energy efficiency, enhance living conditions, and ensure long term viability. The development team will complete unit interior improvements, building systems upgrades, the addition of a community room, and an exterior renovation to greatly enhance the cosmetic appearance. Construction is currently underway with completion slated for early summer 2018. Rendering of Riverside Apartments in Ventura, CA. Integrity Housing is pleased to unveil its plan to build the Riverside Apartments in Ventura, CA, which is currently used for lumberyard storage. Integrity Housing is anticipated to close on the 1-acre property in early November, and commence construction shortly thereafter. The affordable Riverside Apartments will consist of 23 units (22 units for tenants and 1 manager’s unit) designed to serve low-income families with children. All units have either two or three bedrooms with ample living space incorporating a great room with an open kitchen/dining area/living area, and a breakfast bar. Community amenities will include a community room, laundry room, playground, a basketball court, and a centrally located picnic/BBQ area. The project plan incorporates sustainable construction best practices, with an emphasis on energy and water conservation. All landscaping will be drought-tolerant, and units will feature Energy Star appliances, LED lighting, high-efficiency heating, and energy-conserving windows and insulation. Wherever practical, the project will incorporate recycled and repurposed materials. Stay tuned for information on the ground breaking of this exciting project! Residents at Olivera participated in the EngAGE Community Cup on Saturday, September 16, 2017. On Saturday, September 16, 2017, residents from Olivera Senior Apartments took part in the first annual EngAGE Community Cup. The event, held in Cerritos, CA, featured friendly competition among 24 senior housing communities. Olivera residents participated in athletic events, art shows, and a talent competition in an effort to win the coveted Gold Cup. Although the Olivera team was two medals short of winning the grand prize, the participants certainly earned a gold star for effort! Great job team Olivera! Thank you for being a part of our development family. From the entire Integrity Housing team, happy fall!